Designed in 1953, the Single-Six was Ruger's first revolver, following the initial success in 1949 of Bill Ruger's Mark I semi-auto .22LR pistol. In the decade of the &apos;50s, Westerns were all the rage both in the theater and on the new fangled television. This medium allowed a whole new generation of kids to enjoy the old B westerns of earlier decades. Barrel Length: 4 5/8 in. With that and the subsequent demand for sixguns, Bill Ruger realized that if he could produce a pistol people could afford, he had a sure market. But of course, starting off with a great big .44 special would probably have been a disaster. So he started small and thus we have the Single-Six, now more than 50 years old and still being produced. However, while a traditional styled sixgun was the order of the day, Ruger did not simply copy Colt's design of 1873. Instead, he replaced the workings with something a bit more modern and much stronger. In fact, the action is so strong that practically any gunsmith will tell you that they don't have much experience repairing these revolvers (modifying and customizing, yes. Repairing, no.) They simply don't break with any frequency unless they're severely abused. The original run of Single-Six production ran from 1953 to 1962 with the early revolvers being offered with two barrel lengths. One interesting aspect of the early production guns is a flat loading gate instead of the contoured shape we normally think of. This was corrected in 1957 as well as the addition of other barrel lengths. Revolvers made during this period are generally refered to as "Flat Top" revolvers due to the appearance of the top strap. The next production run would last from 1963-1973 with changes in the grip frame, the addition of adjustable sights on some revolvers, and other improvements. 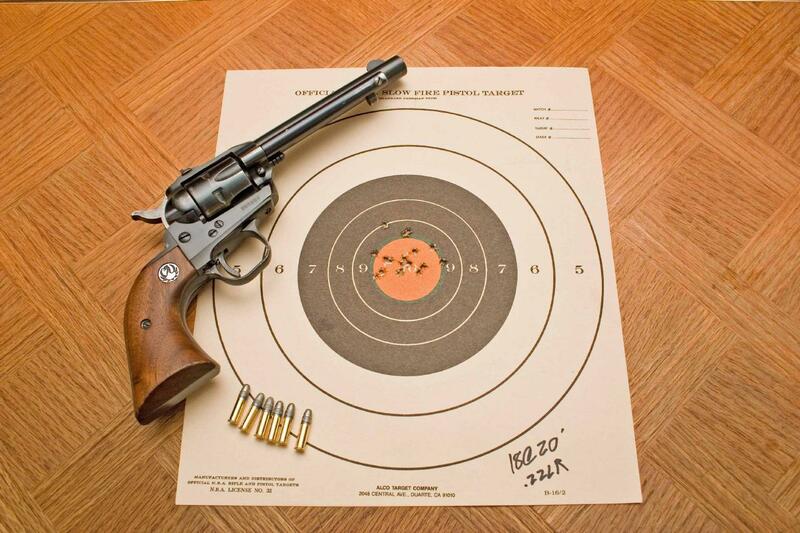 Revolvers produced during this period are refered to as the "Old Model" while all revolvers made prior to 1973 are frequently known as "Three Screw" revolvers for the three screws visible on the frame. In 1973, the Single-Six had been in production for 20 years, a decent run by any standard. It is estimated that about 500,000 of these revolvers had been sold at this point. Ruger had produced perhaps one of the most populare sixguns outside of military and law enforcement. But Ruger had also made several advances over those 20 years as well as devloping a means to make their revolvers safer to carry holstered with a full complement of six rounds in the cylinder, at last making six shooters able to safely shoot six. The time was now right for the Single-Six to get an upgrade. In fact, every revolver in the Ruger line up got an upgrade that year, mainly as a result of this innovation. The Colt Single Action Army of 1873, on which Ruger, along with other manufacturers, modeled his sixguns, was designed with the firing pin attached to the hammer which would directly impact the primer of the cartridge in the cyliner. Later Colt guns placed the firing pin in the frame but it was still directly struck by the now blunt hammer and with the hammer down, the firing pin still protruded through the frame. As a result of this, safety demanded that only five rounds would be loaded in a revolver, with the hammer resting on an empty chamber. This would prevent an accidental discharge if the gun were dropped or otherwise receivd an impact or if the hammer got snagged on a shirt of belt or other object. The easiest way to ensure this was to load using a pattern of "load, skip, load, load, load, load" which would, result in the empty cylinder ending up in the proper position without any extra thought. The Single-Six shared this problem. In 1973, Ruger rectified this on his arms through the use of a new "transfer bar" safety system. With the transfer bar system, the shape of the hammer was changed to a stepped profile which left the top of the hammer resting firmly against the frame of the revolver while creating a sizable gap between the hammer and the firing pin, thereby preventing direct contact. As the hammer is pulled back, a bar rises out of the frame and is positioned between the hammer and the firing pin. This bar is brought forward to its final position, resting against the firing pin,	as the trigger is tensioned. When the trigger breaks and the hammer falls, it strikes this bar which transfers the force into the firing pin which discharges the round. The transfer bar then returns to its resting position once the trigger is released, again leaving a gap between the hammer and the firing pin. During a decocking operation, the slow stroke with the quick release of the trigger causes the bar to drop away well before the hammer can reach the frame. No more hammer resting against the firing pin. This same system is used on all ruger revolvers manufactured after 1973 and makes all their weapons safer to holster with six rounds in the cylinder. 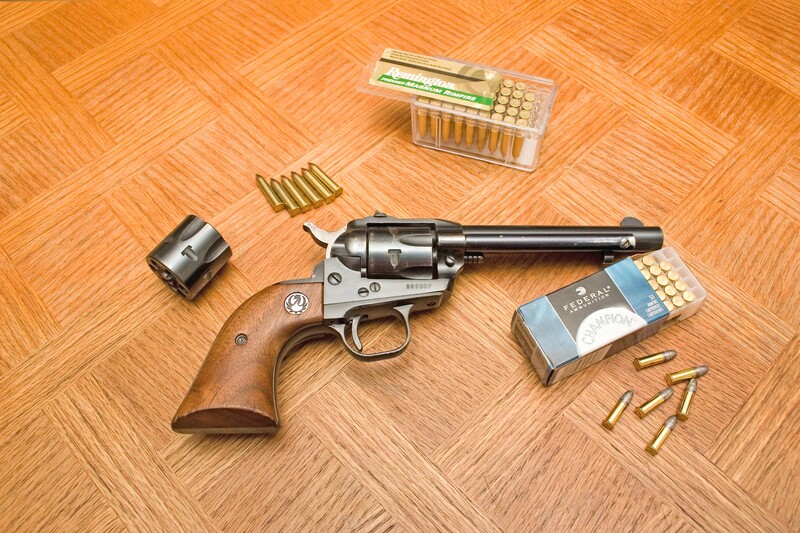 For those owning old model revolvers, Ruger offers a free conversion to the transfer bar system for nothing other than the cost of contacting their customer service department and shipping the revolver back to them for inspection and alteration. But Ruger is not unaware of the cost to collectors such changes can have so in order to preserve that value, all the parts are returned with the newly updated revolver and, should the desire arise, can be reinstalled by any competent gunsmith. The transfer bar conversion can be done with a very high degree of confidence. I am not aware of any reports of this system ever failing and I have talked to several dealers, gunsmiths, and plain ole shooters in my area, all of which have given this same assessment. Another, less desirable change, in my mind at least, was that of a smaller grip frame. As I've indicated elsewhere, my hand fits very well around a traditional Old Army grip. I could get used to the new grips, but they just don't feel right in my hand. This change in grip was later accompanied by the offering of different finishes, a Bisley model Single-Six and eventually a Single-Six chambered in .17 HMR which is still available. But the changes were not all bad. The new model Single-Six is generally tighter and manufactured to better tollerances than the old model ever was. What this means for shooters is that these sixguns will outperform most any of their older cousins. With so many tin cans, oranges, and grapefruits gathering on the firing line, the additional accuracy is most deffinitely welcome. All in all, it is estimated that over 1 million new model Single-Sixes hvae been produced to date. Added to the 500,000 "Three Screw" Single-Sixes, over 1.5 million of these revolvers have been produced thus far and it still enjoys popularity among adults and youngsters alike (with adult supervision, of course.) With that kind of production, it is safe to say that the Single-Six will be with us for quite some time. It is also a testament to the insight of Bill Ruger in realizing the potential demand for such a pistol and for seeking to produce it at a price well within the reach of most folks. An interesting side note, indicative of the popularity of these weapons, is that the price of a used Single-Six pretty well matches or slightly exceeds the price of a new pistol suggesting that there is as much or more demand for the old models as there is for the new models. When I first read of the Single-Six in John Taffin's book Single Action Sixguns late in 2007, it was a time when ammunition costs were on a sharp rise and my budget was on a bit of a decline. After reading what he had to say, I decided that was a gun I wanted to have. Being a budding collector, and also due to my less than positive impressions of the feel of the new model revolvers, I opted to seek a bit of history and sought out an old model. For this purchase, instead of haunting local pawn shops and gun dealers, I opted to try one of the online exchange sites. In my case, I chose www.gunsamerica.com. This may seem to some as something more than a little risky—and there is a certain risk involved when it comes time to exchange cash for goods—but most sellers who are registered there are proper gun dealers running a legitimate business or individuals looking to make an honest trade so the odds are certainly in my favor. Still, caveat emptor applies equally as much here as it does anywhere else. 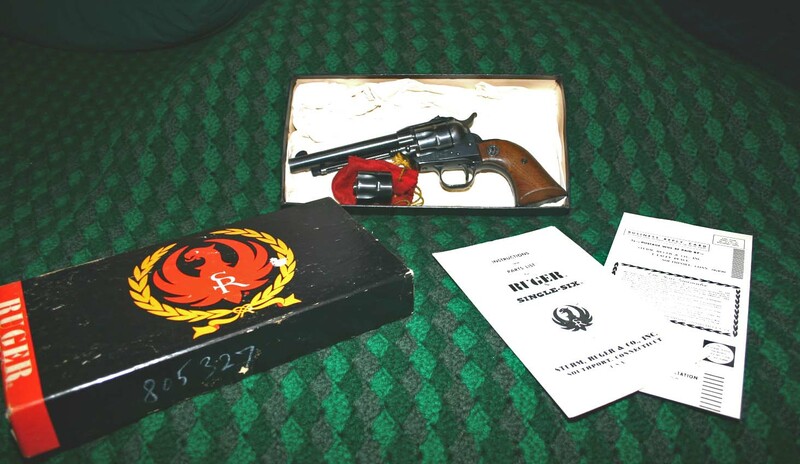 After browsing the selection in search of those that seemed to be in my price range (something like 100 of these were up for sale at the time), I selected a convertible model which seemed to be in reasonably good condition, still had the original box and paperwork, with a price I could handle and made an offer to the seller to purchase this pistol. My online experience was certainly not flawless as there were communication problems with the seller however, ultimately, he did receive payment and I did receive the pistol, as advertised with the exception of a small ding on the end of the barrel where it had obviously been dropped. Checking into Ruger's serial number list, this pistol seems to date to 1968. There is a good amount of holster wear, indicating that the previous owner or owners gave it a good, solid workout. I don't mind seeing this in a revolver that's older than I am, it gives the pistol character. While not a premium grade collectable, it's deffinitely a shooter. I should note that one reason I selected this revolver was that it has not received the transfer bar conversion. This ensures that if I do have this done that I will also have 100% of the original parts and not risk one or more going missing before the revolver ever got to me. It took me a while to figure out how to control and sight this pistol and I'm still not sure I'm handling it quite right but once I did, I was satisfied by the performance. 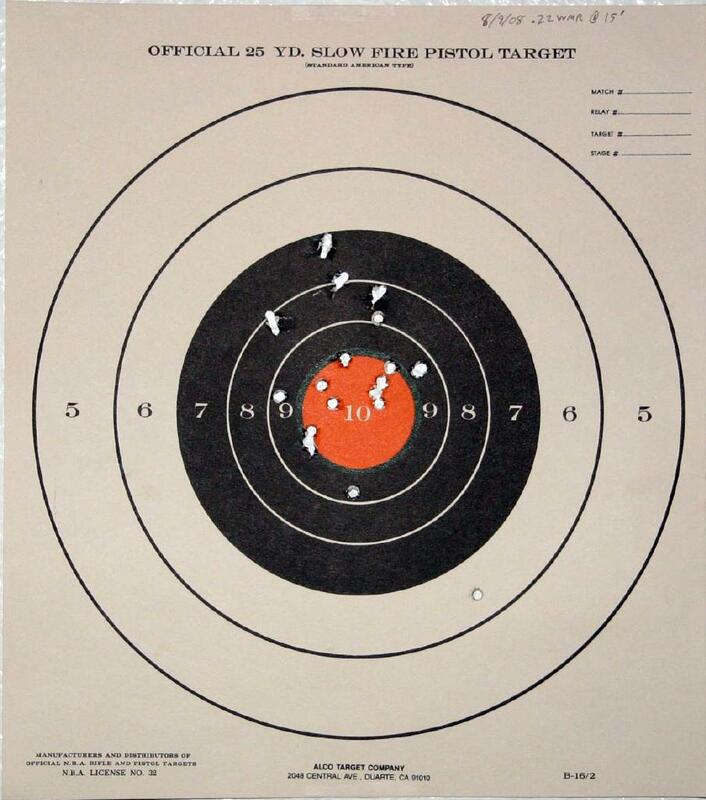 Using Federal's Champion solid lead round nosed ammunition (my prefered .22LR round), I was able to place 18 rounds on the target at 20 feet with about a 1 342" group. While not exactly spectacular, this is still good performance. During my various shooting sessions over the last year, I can only recall having one misfire and at that, all I had to do was rotate the cartridge in the cylinder and hit it again. That does not mean there are no problems with this ammunition, however. From time to time, I have found rounds that are sized very near the high end of the tolerances and, while they fit, require somewhat more care in loading and on one occassion, I also found a bullet that had gone cattywampus in the loading press and was litterally seated at an angle. This one was discovered after not being able to get it to go more than 60% of the way into the cylinder. But such problems have been very rare for me and well within what you would expect from pretty much any bullet maker. As far as chronograph readings go, in this pistol, these rounds clocked out at an average muzzle velocity of 1025 fps with the lowest reading being 993.7 and the highest being 1063. (All but that one were 1033 or less.) Let us not forget that there is one more member of the .22 rimfire family that we haven't mentioned yet. Any revolver that will fire .22LR will also fire .22 short. While some may ask, "Why?" I ask, "Why not?" By comparison, using CCI's mini-mag .22 short, results averaged 701 fps. Not exactly earth shattering speeds, but it will still get the bullet to the target if you're shooting close in. Like all weapons but seemingly more so in revolvers and especially in small bore weapons, this one appears to be sensitive to both ammunition and fouling. With the magnum cylinder in place, using CCI's Maxi-mag 40gr JHP bullets, I had a hard time keeping a group at a mere 15 feet. In fact, if you look at the group of 5 holes at the top of the 7 and 8 rings, you can see that four of them show keyholing with two looking as though the bullet hit flat sideways. At 15 feet, to have a bullet that bad off is something I have never seen before. It would make me suspect the rifling in the barrel has significant damage or there is a burr or similar at the crown but such does not appear to be the case. It seems to me that it is probably more likely to be a disagreement between my revolver and the ammunition I was using. I have since moved to using Remington's 33gr accutip and have not seen this problem recur. Muzzel velocities averaged at 1527.5 fps. This factors to 207 ft-lbs of energy. More than enough for squirrels, rabbits, and any other varmit that finds itself at odds with you. I would not be surprised to find this even enough for a wolf or coyote if the shot is placed correctly. This revolver is a favorite of mine to shoot and accompanies me often to the range and on every desert excursion I make. One can have a great time with a .22 revolver and only spend a few scant dollars in an afternoon rather than the potential hundreds of dollars other calibers can run when you and your buddies go out in force and shoot off hundreds of rounds. One change I want to make to this gun is to have the action smoothed and tuned. It seems to have suffered over the years and is now very stiff. (Lets not forget that this pistol is now 40 years old.) It still functions relatively cleanly but it can be so much better. I'm also not sure about the wood grips. Since this pistol is not a "new in the box" collectable, I feel no compunction against changing them out. Likely, I'll end up putting either a set of wood grips with a nice, flowing grain or ultra-ivory grips. Eventually, I also want to pick up a new model Single-Six and place these side by side so I can properly compare how they stack up against each other. So am I satisfied with this purchase? You bet I am. This is a fun pistol to shoot, even if it isn't the most accurate. Besides, for a shooter with only moderate experience, learning how to compensate for a slightly innacruate pistol has only helped to improve my performance with those that are properly timed and fitted. If you have a hankering for sixguns but don't want the expense of buying shells for the big bore calibers, this is a good way to go. The Single-Six is also especially useful for orienting new shooters to gun handling and single-action habits such as not lifting the barrel off target when you bring the hammer back. In my oppinion, this is a revolver that deserves a place in the collection of every true sixgunner.